Precor is a fitness equipment manufacturer that has designed quality machines for health clubs and home use for 30 years. Their innovative technology focuses on smooth, ergonomic motion, proven science, and quality construction. 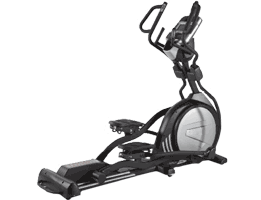 In 1995, Precor introduced the first ever elliptical trainer, the Elliptical Fitness Crosstrainer™ (EFX®). Smooth Fitness was founded in 1984 and was recently acquired by new owners. A manufacturer of home fitness equipment with an extensive line of treadmills, elliptical trainers, exercise bikes, and home gyms, Smooth Fitness markets and sells almost exclusively online. 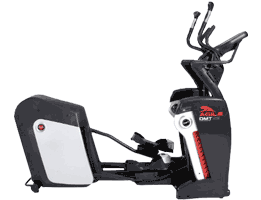 With an array of unique features, be on your way to fitness with the Smooth Agile DMT. For decades, Sole has been a leader in the fitness equipment manufacturing industry, selling to individuals and hotel fitness programs across North America. Over the last few years, the company has expanded its international presence to include new markets. Today, it's one of the fastest growing brands in the U.S. and Canada. The company focuses on design innovation and excellent customer service. 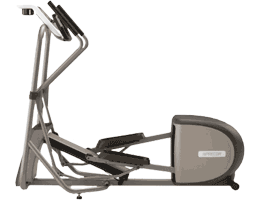 Diamondback is a fitness equipment manufacturer that has designed quality machines for both home and fitness club use since 1991. 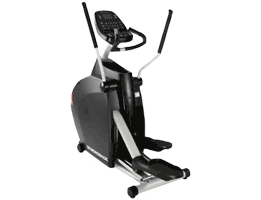 Over the last two decades, they’ve developed an extensive line of products including: elliptical, recumbent bikes, upright bikes, and indoor cycling machines. Their equipment has received media coverage in many well known outlets including. Vision Fitness is a division of Johnson Health Tech, a quality fitness manufacturer in business over 35 years. Johnson Health Tech is the largest fitness equipment manufacturer in Asia and the third largest across the world. They have a lengthy track record of satisfaction and a stellar reputation for high-quality home and commercial fitness equipment sold everywhere. 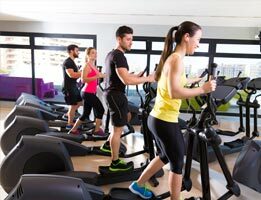 When it comes to working out, there are two machines that most members of gyms tend to gravitate towards: the treadmill and the elliptical. Both of these machines are similar in many ways. For example, each machine improves cardiovascular health, and each increases your overall aerobic capacity if used frequently. 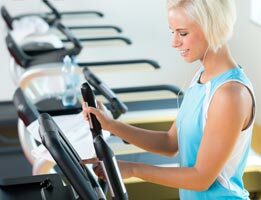 Yet, in spite of their similarities, treadmills and ellipticals offer different ranges of workouts. These machines do improve the overall health of anyone who uses them, but there are different advantages and disadvantages to each machine as well. Which machine you choose will depend on what you’re personally looking for in a workout routine. The treadmill is a tested workout that has literally been around for centuries. The concept of a treadmill is pretty simple: using your own body weight, you “pull” yourself across the belt of the machine through the process of running. Because of its simple nature, the familiar movement of running makes this an optimal workout machine. It’s also very versatile — you can adjust the speed and incline of the device, and a variety of training programs gives you options on how you want to workout. There are downsides to the treadmill, however, and depending on your personal circumstances you may want to avoid its use. Treadmills are hard on weaker joints, and those with weak knees, ankles, and hips can feel pain after using them. Depending on the machine, the length of the belt can also cause an awkward workout routine (long legs on a short belt, for example, can cause a tall runner to have to make smaller strides). And while the workout is a familiar one to most individuals, let’s face facts: running is hard. If you don’t like to run, the treadmill is probably a dreadful thought to you more than a workout regime. 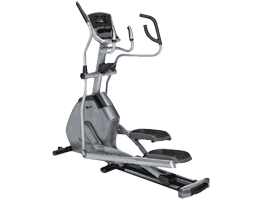 Elliptical machines make up for a lot of the problems seen with treadmills. For starters, ellipticals are a non-impact type of aerobic conditioning — you don’t land on your feet with every movement like you do with running. This makes the machine more enjoyable for those with weaker joints who are still looking for a workout. There are more cross-training options available, too, with some elliptical machines allowing the handles to move back and forth as you move your legs. Reverse movement of the machine is also an optional workout, which allows different muscles in the body to get exercise. Finally, with ellipticals the perception of the workout seems lighter than what it is — in other words, you don’t feel as tired when you’re done doing your workout as you would with a treadmill. There are some problems with using ellipticals. Overall, they are less versatile machines — you can’t do an “incline” workout, for example, like you could with a treadmill. The speed is determined by you the user, not the machine, and other workout programs are limited in using an elliptical. Ellipticals also provide less of a “weight-bearing” workout, an important aspect of exercise that helps improve bone strength. This can be especially problematic for those who are elderly, as bone deterioration diseases tend to be among one of the top concerns for members of that age bracket. The momentum of the machine can also lessen the workout itself, causing you to believe you’re getting a workout when in reality you’re body is just moving along with the elliptical. 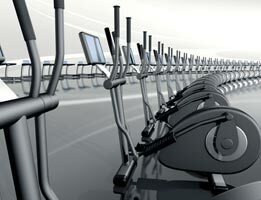 When it comes to calories burned, both ellipticals and treadmills tend to provide a relatively equal workout. If your concern is merely with what workout is best, at least in that measure the two are pretty much the same. Each person is different, however, and how your body reacts to each machine may change the amount of calories you actually burn. Those who have injuries to their joints or are new to physical workouts may see the benefits of choosing an elliptical over a treadmill. The motion of an elliptical machine tends to favor those who are not yet used to repetitive motion or who need a less strenuous workout for their bodies. On the other hand, seasoned pros and those who enjoy running probably find treadmills more enjoyable. The harder workout will improve these experienced individuals much more than an elliptical routine might. In the end, it all boils down to preferences. The machine that’s best for you will be determined by what you like more, or more accurately what your body responds to better. Keep in mind what you need in a workout routine and try to balance that with your body’s limitations as well.